Vysehrad sits atop steep cliffs next to the Vltava and back in 1085 it was the fortified royal residence for the King of Bohemia and Poland. These days it’s an interesting spot for both tourists and locals to visit and relax in. The area features lush lawns, huge trees, important architectural sites from various eras, great views over Prague, a range of dining options plus a fantastic kids playground. 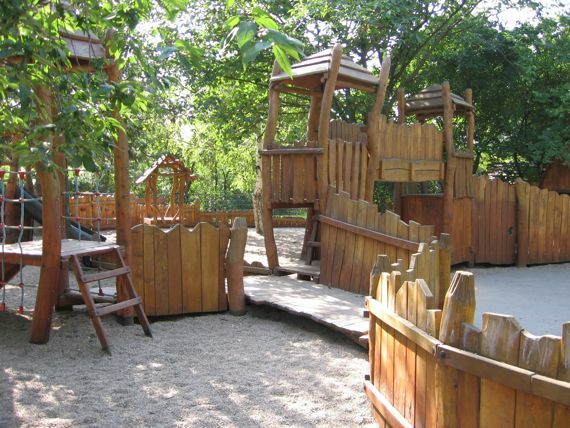 The playground is constructed out of wood and features a zip line, slides, various climbing frames, see saws, swings, play houses and tunnels (which are very popular with the kids). The area set aside is sheltered and peaceful with plenty of benches for parents to sit on, a water bubbler and totemic sculptures of characters from Czech legends. There are no toilets here but you will find toilets at the nearby cafes and restaurants that are scattered around the grounds. It’s worth a look around the area in general, views of Prague can be appreciated from three different sides, giving you a unique perspective on the city. There are a range of important architectural buildings dating back many hundreds of years, the oldest of which is a Romanesque Church from the 11th century! Worth a look is the cemetery at Vysehrad which houses the countries most famous musicians, artists and writers such as Antonin Dvorak, Alfons Mucha, Jan Neruda, Karel Hynek Macha and Bedrich Smetana. The grounds at Vysehrad are beautifully maintained, lawns are lush and garden beds manicured; it’s a great spot for picnics or just to laze about on a blanket. 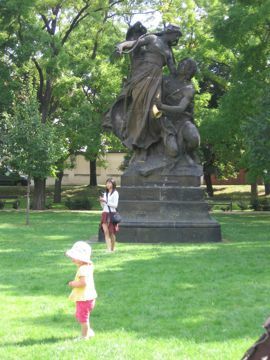 Lucie loved just running around burning up energy and would stare up now and again at the huge sculptures of Czech legends next to the Church of Saint Peter and Paul. If you’re up for lunch, a beer or coffee then you have many options to choose from in a variety of scenic locations. Of particular note for those who love Croatian bbq’d meats and vegetables is the Hospudka Na Hradbach which is up a pathway to the right in front of the Romanesque church (St Martin’s Rotunda). The vibe is laid back, casual and local. There is a small but rather rusty set of play equipment for kids but the whole area is sitting on an old sports court so children can kick around a ball or just race around without bothering anyone (not that anyone here would mind). 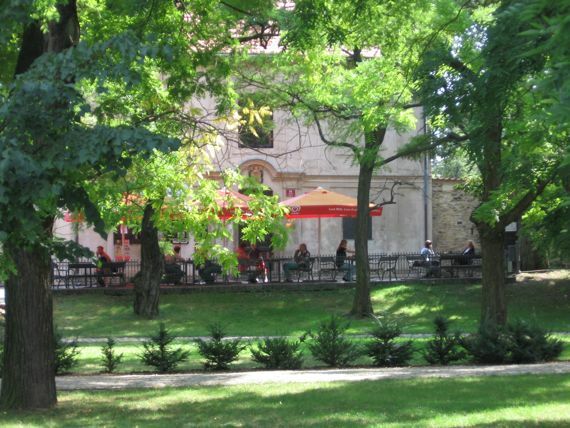 There are tables underneath umbrellas or you may just prefer the old sets of tables and chairs scattered around the huge area underneath trees or positioned to take advantage of the lovely vistas of Prague. Just be warned that the bbq doesn’t usually get going till around 2pm, but if it’s a beer you’re after…well thats easy. DIRECTIONS: By Metro: Take line C (red) to Vysehrad. By Tram take 7, 8 or 24 to Albertov or take 3, 7, 16 or 17 to Vyton. 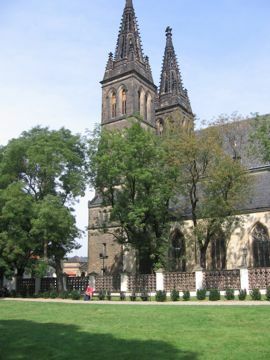 There is paid parking within the historical grounds of Vysehrad on K Rotunde.